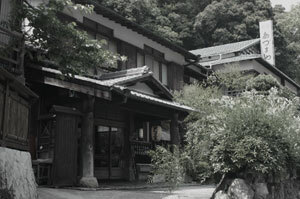 The founder, originally shrine priest, founded Azumaya here some time around the middle or end of the Edo era. The buildings look like a 2-story wooden structure at first glance. However, to the rear there is an additional area of another 2-story integrally integrated connected building, so essentially it can be thought of as a 4-story building. 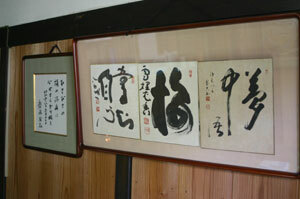 The room capacity is 22 rooms, and all are Japanese traditional rooms. All rooms are named such as “Cherry,” “Bamboo,” “Cedars,” and each has its own unique character through individualized décor design of alcove posts. We have earned the love and respect of another writer, Kyoshi Takahama, and many other authors and artists. We belong to the nation-wide group of 135 inns of “Protect Secluded Hot Spring Association,” and we are a destination for members as only one of five such hot springs in the Kansai area.